Two paper stops assure exact position of each crease location on repetitive jobs. 1-4 Creases with One Setup. Maximum crease (to backstop): L 14.1" x W 13.7"
Width can accomodate a 12x18" digital sheet landscape. Manual Creasing for Large Formats. Paper Size: 12.6" x 17.7"
Prevents tearing or cracking of digital printouts. Foot pedal, hands free operation. Welcome to MyBinding video. 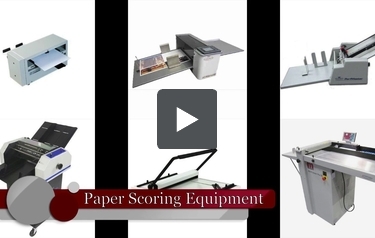 We have the guaranteed lowest prices on a wide selection of paper scoring equipment. If you’re looking for a way to create your own thermal binding or perfect binding covers and need to fold heavy card stock or coated papers, then chances are you’ll need a scoring machine. A scoring machine is designed to crease your document to make it possible for easy folding and processing. Scoring equipment is available with a rotary scoring wheel that used for creasing documents or with compression scoring mechanisms that press a crease into the paper. Compression scoring devices tend to provide a higher quality finished product but are slower than rotary scoring devices. If you already know what you need, just click around and find exactly what you want. If you have any questions at all, just give us a call and our award-winning customer service would love to help you find exactly what your company requires. When image matters, MyBinding.